Tonight I'm drinking Wee Mac Scottish-Style Ale brewed by Sun King Brewery in Indianapolis, Indiana. This is Beer 7 from Trade 2 with Marathon Marie. I think I'm taking Beer 8, the last one, to a tasting with some local nerds in a few weeks. 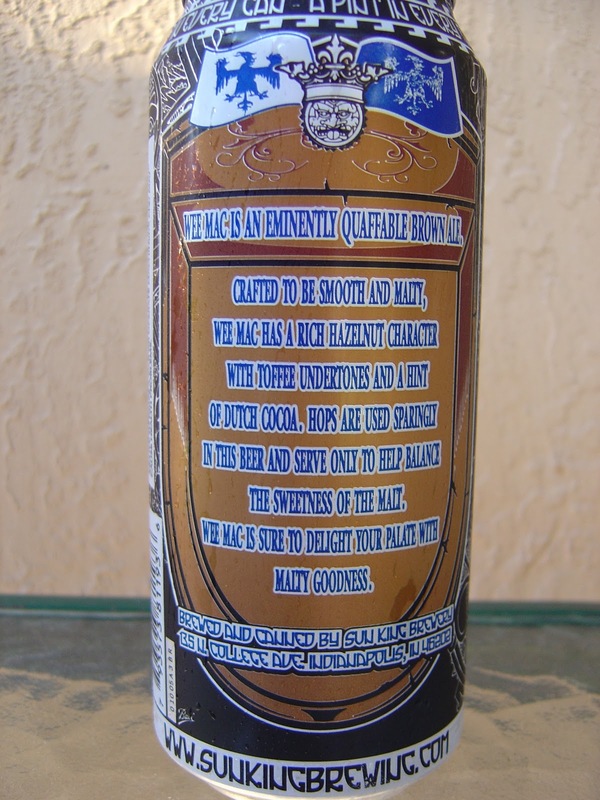 Anyway, this beer comes in a highly-decorated, medieval-themed, 16-ounce can. 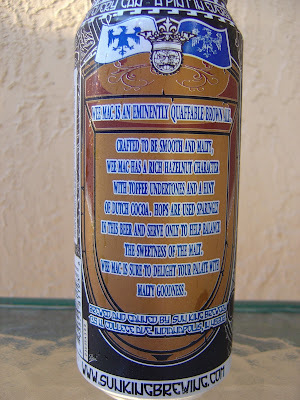 Despite the name, the back of the can calls this "an eminently quaffable brown ale". I'm not sure there is any contradiction, but I'll admit I was not expecting what I tasted. Let's get right to that part! Earthy, dirty, peat moss aroma with caramel topping. VERY subtle flavors to start. They do grow a little, but it takes deep thought and concentration. Be Prepared! Earthen flavors with just a touch of fruit are what first come to mind. Even a little tart. 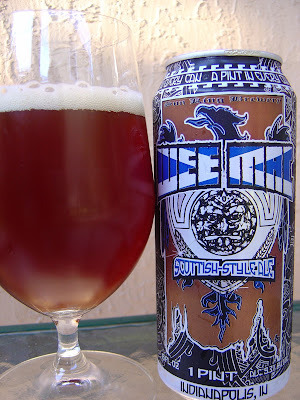 Caramel, sweet candy, sugar, yes this is a sweet beer in the beginning. Again, I was expecting different and much bolder. Yeast flavors are noticeable if you're paying attention; and once you find them, you will never lose it--a very nuanced yet enjoyable touch. Wee Mac has nice balance, not just a sweet machine. Good body, excellent carbonation, smooth, pleasant to drink. 5.3% alcohol where? I wish some part of this beer would have said "Hey, look at me!" even in a polite way, but this was definitely the shy kid in the back of the room. Whatever, very interesting. I am betting you won't be surprised, but I have a theory. I got a few new glasses from Amazon in the mail today to replace the broken Mikasa and Dogfish Head glasses that bit the dust these past few months. Happens with a blog like this I guess. My hypothesis says that Riedel brand glasses make flavors disappear. Is that possible? Since this was my first beer with them, I'm not sure. But for now, it's out there. Don't worry, I will do plenty more testing! I love my Riedel glasses! The only problem I have though is they break REALLY easily, and the shards go 5 miles across the house from the breaking point...messy, messy! Yeah, Vanessa. These are great, but are extremely thin. I was expecting something a little more hefty. I guess I can be careful.